Learn how to get started improvising with easy piano chords for improvisation in this beginner chord piano lesson. What comes to mind when you hear the word improvisation? Jazz is probably at the top of the list. This makes sense as jazz is rooted in improvisation. Webster's dictionary defines improvisation as "something that is performed, made, or done without preparation." I agree with this definition. But, I caution you here. You must prepare if you want to improvise well! It's important to have a good understanding of a few music basics before beginning to improvise. So let's quickly move through these fundamentals. There are three essential elements of music. Rhythm - The systematic arrangement of musical sounds, principally according to duration and periodic stress. Melody - A sequence of single notes that is musically satisfying. Harmony - The simultaneous combination of tones, especially when blended into chords pleasing to the ear; chordal structure, as distinguished from melody and rhythm. I'm assuming that you have a good grasp of basic rhythm. But you can check out this quick video lesson if you need a refresher. It's important to note that in this beginner's guide we'll only be discussing easy piano chords for improvisation within the key of C-Major. Most of the melodies we know come from the diatonic scale. Diatonic is just the fancy word we use for the seven notes that make up the most common musical scale spanning an octave. The great American composer, Aaron Copland said; "From a purely technical standpoint, all melodies exist within the limits of some scale system. A scale is nothing more than a certain arrangement of a particular series of notes." 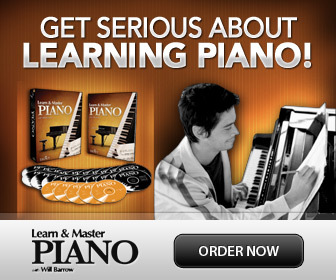 Now let's focus on the easy piano chords called primary chords within the key of C-Major. Primary chords, refer to the three most common chords within any key beginning on the first, fourth, and fifth scale degrees. In the key of C, these chords begin on the notes "C," "F," and "G." There are other chords, of course. But we only need to focus on the three primary chords in this lesson. A chord refers to typically three or more notes that sound together. There are all sorts of chord conglomerations. But the triad is the heart of western music. A triad refers to three notes stacked in thirds. Notice the notes that make up the I chord, or C-Major chord. 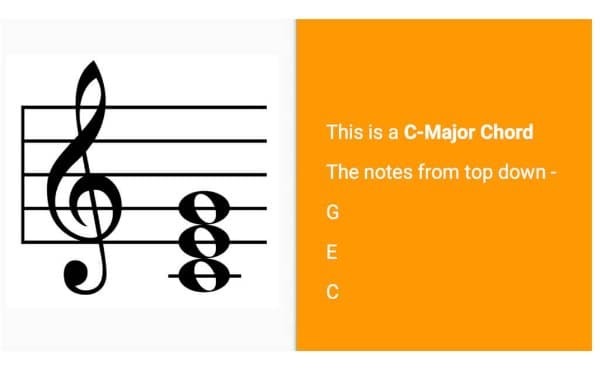 The notes "C," "E," and "G" make up the C-Major chord or C-Major triad, also known as the I chord in the key of C.
The F-Major chord, also known as the IV chord in the key of C, begins on the note F. It's comprised of the notes "F," "A," and "C."
And the G-Major triad, or V chord, beginning on the note G is comprised of the notes "G," "B," and "D."
At the end of the day, a good improviser can learn to play a song just by listening to the chord structure and melody. "How?" You ask. Focus on the common notes between the melody and harmony. 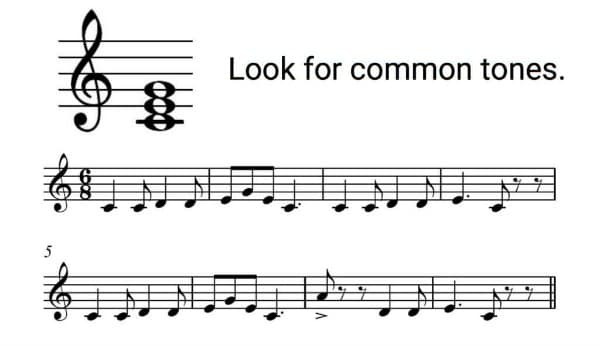 Notice that the note "C" is in every measure except for the second to last. Therefore, the C-Major chord (or I chord) works in every measure except the second to last. Now, it's not the best choice for every measure, but it works. Here's how I approach harmonizing this tune. Notice that I've chosen to harmonize the first measure with a C-Major followed by a G-Major chord. The C-Major chord works well with the C melody note because they share this note. I've chosen to harmonize the "D" melody note with a G-Major chord because "D" is the fifth of the G-Major chord. In other words, "D" is the common note between the melody and harmony. Take a look at measure 7. 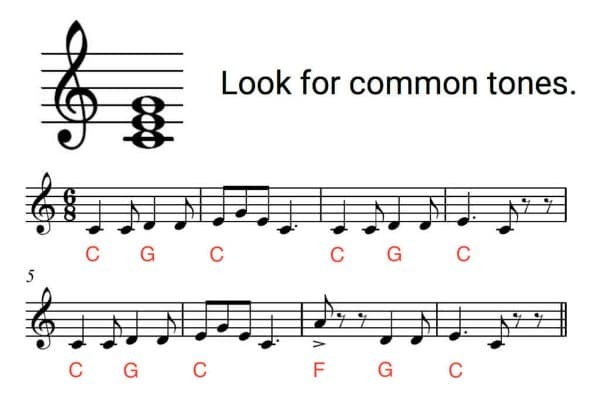 The "A" melody note does not work with the C-Major chord (notes C, G, E) or the G-Major chord (notes G, B, D), but it does work with the F-Major chord (notes F, A, C). (Remember, we're looking for common tones between the melody and harmony.) The "A" melody note matches up with the F-Major chord. Success! Excellent improvisers have a firm grasp of the three elements of music - rhythm, melody, and harmony. They understand basic rhythm, the diatonic scale (the C-Major scale for our purposes today). And they know that they have to look for common tones between the melody and harmony. So there you go! I hope you've enjoyed this beginner's guide to easy piano chords for improvisation! About the Author: This guest post about easy piano chords for improvisation was written by Chris from PracticeHabits.co. Here is what he says: "I offer all sorts of resources in the form of articles, practice guides, exercises, and original sheet music at PracticeHabits.co. I've enjoyed spending a bit of time with you today! Best of luck to you on your musical journey. Your friend, Chris"